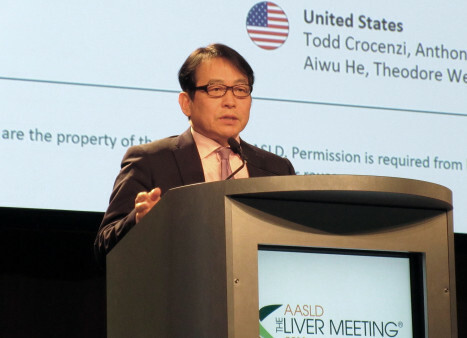 The checkpoint inhibitor Opdivo (nivolumab) shrank or stabilized tumors in just over half of liver cancer patients with serious liver function impairment, similar to outcomes previously seen in people with less advanced liver disease, according to a presentation at the American Association for the Study of Liver Diseases (AASLD) Liver Meeting, held this week in San Francisco. Over years or decades, chronic hepatitis B or C, heavy alcohol use, fatty liver disease and other causes of liver injury can lead to the development of liver cirrhosis and hepatocellular carcinoma (HCC), a type of primary liver cancer. HCC is often detected late and is difficult to treat. 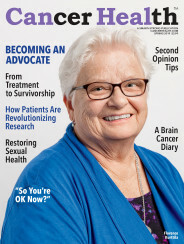 Most patients who try the standard first-line therapy, the kinase inhibitor Nexavar (sorafenib), experience disease progression or develop unacceptable side effects. Opdivo is a monoclonal antibody that blocks the PD-1 immune checkpoint receptor on T cells, which plays a role in regulating immune function. Some tumors can hijack PD-1 to turn off immune responses against them, and drugs like Opdivo can release the brakes and restore T-cell activity. But these drugs do not work for everyone or for all types of cancer. The Food and Drug Administration approved Opdivo for hepatocellular carcinoma last year. Another PD-1 checkpoint inhibitor, Keytruda (pembrolizumab), received approval for liver cancer this month. Both are indicated for people who have previously tried or cannot use Nexavar. Masatoshi Kudo, MD, of Kindai University in Osaka, Japan, reported the latest findings from the Phase I/II CheckMate 040 study, evaluating Opdivo as a treatment for people with advanced liver cancer that cannot be surgically removed. Researchers previously reported primary results from this study, showing that Opdivo led to durable responses with a good safety profile. However, most of the patients in that analysis were classified as Child-Pugh A, meaning they had well-preserved liver function, or compensated liver disease. Kudo presented findings from a subgroup of 49 trial participants classified as Child-Pugh B, meaning they have more severe liver function impairment and a higher risk of death. A majority of these participants were men and the median age was 67. About 40 percent had hepatitis C and 16 percent had hepatitis B. One in four had cancer that had metastasized, or spread beyond the liver. Half had previously used Nexavar. All participants were treated with IV infusions of Opdivo every two weeks until they experienced disease progression or unacceptable toxicity. After a median follow-up period of about a year, eight people remained on treatment, 33 had stopped because of disease progression and two did so because of drug side effects. The objective response rate—meaning complete or partial tumor shrinkage—was 10.2 percent. All of these were partial responses. Another 44.9 percent had stable disease that did not worsen. Together, these resulted in a disease control rate of 55.1 percent. A small number of patients had deep and durable responses, Kudo said, including two people with ongoing responses. Responses were similar for people with hepatitis B and those with hepatitis C. The median duration of response was 9.9 months. The median overall survival was 7.6 months, which was longer than the survival times of 2.5 to 5.0 months previously seen in prior studies of Child-Pugh B patients treated with Nexavar. Kudo compared the response rates with those of Child-Pugh A patients in a previous analysis. That group had a higher overall response rate of 20.2 percent, including 3.1 percent with complete tumor regression, but the stable disease rate and disease control rate were similar to those of the Child-Pugh B patients (40.8 percent and 61.6 percent, respectively). Treatment with Opdivo was generally safe, and safety profiles were similar for the sicker Child-Pugh B patients and those with milder Child-Pugh A liver disease. Two people (4.1 percent) stopped treatment early because of side effects. The most common side effects were rash, itching and gastrointestinal symptoms. Liver-related adverse events, including immune-mediated side effects that can occur when checkpoint inhibitors release the brakes on immune function, were rare. “Nivolumab showed promising efficacy and tolerability in patients with Child-Pugh B status, supporting further investigation in this patient population,” the researchers concluded. Click here to read the Liver Meeting study abstract. Click here for full prescribing information for Opdivo.